After you've created your plan, you can modify the issue sources for your plan at any time. Note that changing issue sources will affect your plan's scope, releases, and teams. Click Edit sources. The 'Create' page will be displayed. In some cases, you might have different issue sources with different estimation methods, but you want to import them into one plan in Portfolio for Jira. A plan can only have one estimation unit, and therefore, you will have to convert estimates of the secondary planning unit to the primary planning unit. In this section, you'll learn how to select a conversion ratio that will convert time to story points once your plan is created. The conversion factor is only applied to issues coming from the respective issue sources that don't have an estimate set in the plan's planning unit. Let's say you have one plan that's using story points, and another plan that's using time-based remaining estimates. Only the ones coming from the plan that uses story points will show up as estimated in the table. Click Advanced settings for the board where you want to apply the conversion rate. The advanced settings for the selected board will display. Select On, and then set the number of hours that will be converted to one (1) story point. Click Save, and then refresh your plan by clicking Calculate. If you have an issue associated with multiple issue sources, Portfolio for Jira will only consider the conversion factor of the first source. Whenever you commit estimate changes back to Jira, the estimates will be set in the plan's planning unit. Let's say you have an issue with a remaining estimate of 2 hours, and you've applied a conversion factor of 1 hour = 1 story point. When you convert the time of 2 hours, the issue will then have 2 story points. 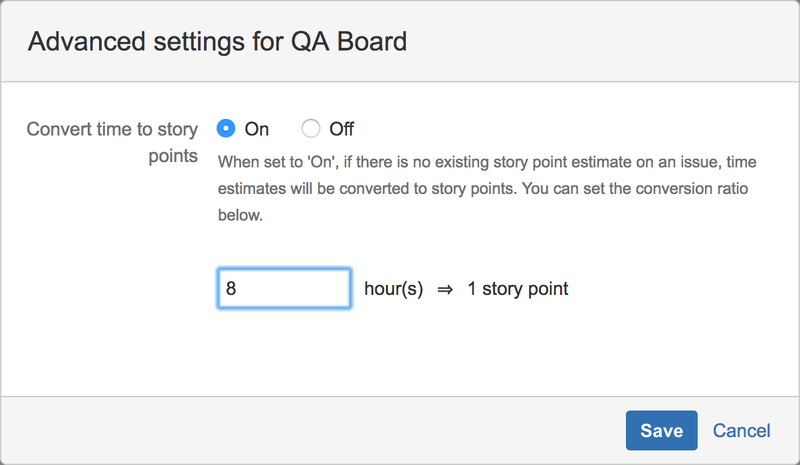 However, if you want to commit the new issue estimate back to Jira, the result will be 2 story points and 2 hours remaining. This means that there's no conversion applied when committing back to Jira.